After months of development and tests, TonyBet Poker released its first open-face Chinese poker mobile app for Android powered devices. 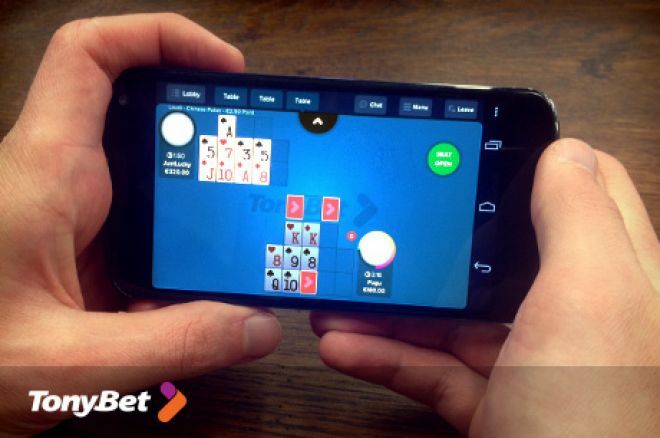 While the iOS app waits to get Apple’s green light for landing on iPhones and iPads, players with mobile devices running on Google’s Android can now enjoy TonyBet Poker’s OFC poker experience on-the-go any time they feel like playing. Available for free download from the Google Play Store, the TonyBet Poker application runs on smartphones and tablets running Android version 2.2 (Froyo) and higher. The first Android application to offer players OFC online poker games for real money from mobile includes all the features of TonyBet Poker's downloadable client (available both for Windows and Mac OSX). TonyBet Poker’s open-face Chinese poker Android app offers games in all of the room's regular variants, such as classic, pineapple, turbo and OFC poker. Android users will also get full access to sit-and-gos, tournaments and cash tables with limits going form €0.02 per point up to a hefty €5 per point. As for the in-game interface and commands, TonyBet Poker developed its mobile app to make the playing experience as smooth as possible, with the game selection made simple with a user-friendly. Action at the mobile tables is also intuitive, as all players need to do is drag their cards from the middle of the screen to their selected OFC hand. Cash game players will be happy to know that new shortstack tables are now available also on mobile, allowing everyone to try the real OFC poker high-stakes experience with half of the standard buy-in exposed. Talking numbers, this means that instead of needing €100 at the tables to play for €1 per point, players will be able to sit down with €50 and still play for those stakes. Open-face Chinese poker tournament players can also use the TonyBet Poker Android app to access a vast range of real-money sit-and-go tournaments, with buy-ins starting from as low as €0.50 and increasing to €10 per game. "I can't help to brag about how great things are going for TonyBet Poker," said Tony G, the room’s owner. "It's only been two months and we're counting players by thousands. That's simply amazing for the site which is still in beta, is not a part of any poker network and has only Open Face Chinese poker. "I had a dream of making an online poker revolution with this and I can already see it coming true. And the great news is – it's only a start." To become part of the latest poker craze and see for yourself why hundreds of poker players flock to the TonyBet’s OFC poker tables every day, open an account on TonyBet Poker and download the Android app to bring the best of OFC poker fun straight to the screen of your mobile! To keep updated on the latest news on TonyBet Poker, we recommend you follow them on Twitter and Facebook.